A tire gauge is a useful tool when it comes to performing home maintenance on your van, truck, or SUV. By being able to measure the tire pressure accurately, you can ensure that the tire is always ready to perform properly and to the best of its abilities. Over recent years, digital tire gauges have become more and more popular because they are simple to use and easy to read while also giving very accurate readings. This model from Tektron is one of the most trending today, so we’re going to look at why, and see if it could be the best tool for your car tires. As the name suggests, this is a digital gauge manufactured by Tekton. It has an ergonomic design that makes it easy to hold, an easy-to-read screen, and a lighted nozzle. It can measure up to 100 PSI and provides three more types of measurement namely BAR, KPA, and KG/cm (cubed). It boasts an auto shut-off system to protect battery life and is operated by a simple, one-button interface. It should be noted that this is also a tiny tool. 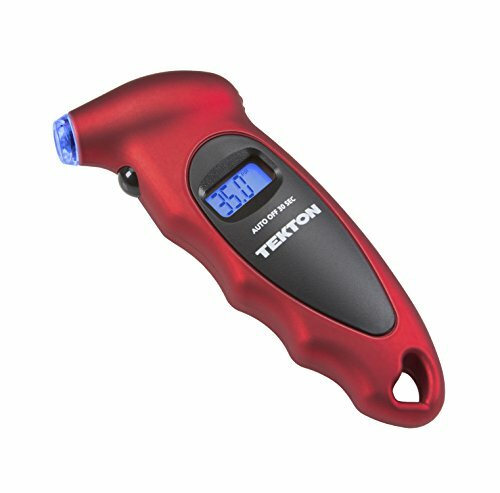 Given its small size, the Tekton 5941 Digital Tire Gauge could be the perfect device for people who need a gauge that is easy to store in a toolbox or perhaps in a glove box. It should also be remembered that it has a wide range of measuring types, with no less than four different measurements available. This should then appeal to anyone who needs to measure their tire pressure across a different range of units, rather than just the standard PSI. Inside the box, you would find everything you need to start measuring tire pressure. That is one tire pressure device and four batteries (one 3V coin cell and three 1.5V button cells). The batteries are preinstalled, so the device is ready to work straight out of the box. This is a very smart, feature-packed design of pressure gauge. Naturally, the light up nozzle is one of the most eye-catching features. It will help you to connect the device that bit easier, especially in low-light conditions or during nighttime. The screen, along with the nozzle, is also very bright, again making it easier to read. Physically, the device has been built to be extremely comfortable to hold. It comes in at a size dimension of 8.2 x 4.5 x 1.5 inches and weight of approximately 3.04 ounces. The one-button operation does take a little while to get used to since it is both a power button and a function button. Hence, you need to practice applying the right kind of pressure to get the response you want. Another thing to note is that this device is very “power hungry.” We don’t come across many designs of digital pressure gauge that require four batteries to work. That though is the trade-off for the power-lighted nozzle and the bright screen. That wouldn’t be too bad either except for the fact that the batteries are of the different types too. That means you’ll need to keep a range of spares on hand for future replacements, which is something that some people could find irritating. As with many such devices, this tool is ultimately very simple to use. You merely insert the nozzle into the valve built onto the tire itself and press down until connected. The device will then give a reading of tire pressure, which it will display on the screen. However, the difference between this device and simpler models lies in the fact that it can display several measurements. So, what you have to do is press the small button to cycle through the different measurement settings available until it displays the unit of measure you require. In that sense, it is a little more complicated than some other models, but it’s still straightforward. Everything from the light-up nozzle to the multiple measurement settings makes this a more complex design of pressure gauge than many others. For some, this is the big appeal of the unit. For those other people who would prefer a simpler design, we would suggest you take a look at the Accutire MS-4021B. This pressure gauge has a design that is effectively the polar opposite of the Tekton 5941 Digital Tire Gauge. It is very, very simple and since it only measures PSI, it doesn’t even have a single button that you need to press! If you want a technologically advanced style of pressure gauge, then the Tekton 5941 Digital Tire Gauge could be the one for you. If you want one that boasts as many built-in features as can be packed into these otherwise relatively simple devices, then this could also be the one for you. It is a very well-designed and effective tool that by way of measuring across four separate settings should provide just about everything you need when it comes to measuring your tire pressure accurately.